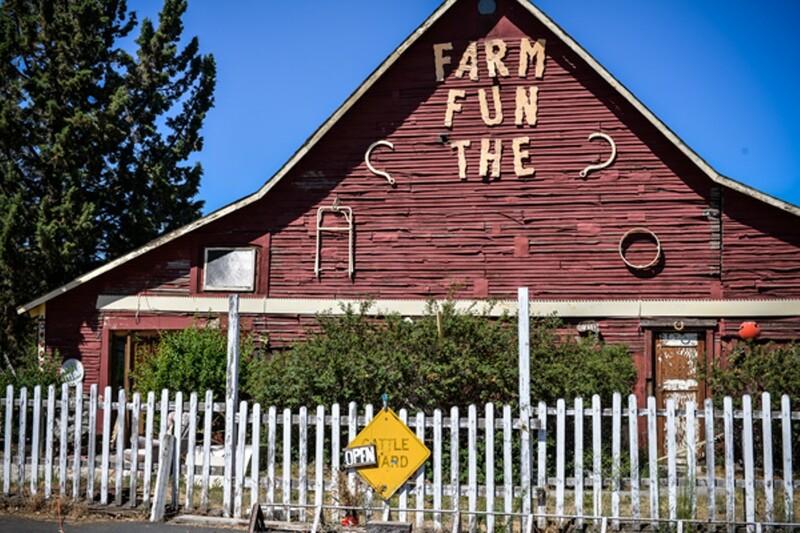 About five miles north of Bend, tucked between the trees on the east side of Highway 97 on a piece of property owned by Gene Carsey, Jr., is the top half of an old farmhouse. Its roof is covered in weather vanes, its windows broken and boarded up. Carsey says it's Dorothy's house, the one that fell on the Wicked Witch of the East after a tornado blew through Kansas and carried it away. Not far from the house, a yellow brick road leads to all manner of curious characters. 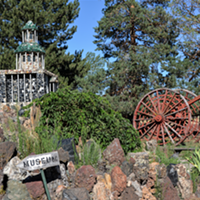 This land—not quite Oz, not quite Kansas—is a quirky antique shop-meets-amusement park called The Fun Farm. When I pull into the property on a sunny Sunday afternoon, there are no other visitors. I walk into a musty room packed with odds and ends—costumes, old toys, antiques. After wandering around for a few minutes, I'm greeted by Carsey, the Fun Farm's 72-year-old owner. He welcomes me and first directs my attention to a massive doll house in the front room. Inside, a miniature television plays The Wizard of Oz. It's the first Oz reference, but far from the last. As we begin our tour, Carsey explains that The Fun Farm (formerly The Funny Farm), got its start as an antique shop, called Buffet Flat, in 1977, which was on the other side of highway from its current location. Carsey says he and his partner Mike Craven (who passed away in 2005) built the shop into a spectacle in an attempt to get drivers to slow down as they flew by at 60 miles per hour. Toward that end, they combined their shared love of second-hand items and their eye for quirky art with a heaping dose of humor. Chief among those initial oddities was a goat named Lucy, who spent her days at the top of a tower decorated with a hand of cards—10 through the ace of diamonds. "It was Lucy in the sky with diamonds," Carsey says, pointing out the Beatles reference. But the visual gag didn't end there. The men made it interactive by allowing visitors to feed Lucy by pulling a pickle up to her using a rope. "I didn't think I'd ever cry when a goat died," Carsey recalls, his eyes beginning to water. After Lucy, the couple recreated the act with a dog called Bear, also fed via rope pulley system. His food of choice? Hot dogs. "[Bear] used to say, 'It's a dog-eat-hot dog world," Carsey quips. When the highway was widened to four lanes, the original location was torn down and the partners spent 18 months embroiled in a land use fight over opening on the east side of the highway, where the land is zoned specifically for farming. After modifying their request to meet the county's demands, they finally got the go ahead to reopen as The Funny Farm in December 1991, with an important restriction: they could only be open on weekends and holidays, and couldn't erect any new buildings. "The county didn't want to let us open up," Carsey recalls. "We were just a square peg in a round hole." He credits the close to 500 people who submitted letters of support for The Fun Farm's resurrection. Carsey claims it's the most the county has ever received for a land use issue. While not a farm in the conventional sense, signs of farm life can still be found here. For starters, the site makes use of an old barn, the shingles on its roof painted to depict a rainbow. (Carsey says the county gave him a hard time about that, claiming it constituted a sign for the business that could be seen from the highway, which is a no-no.) Additionally, there are a handful of farm animals on site, which Carsey allows friends and neighbors to board there. Two turkeys pace about in a caged area outside, while two cows and a calf lounge in a small fenced-in field outside the barn. As we follow the yellow brick road outside, we come upon a Carmen Miranda caricature, her face painted on the side of a building with her mouth and hat jutting out in three sculptural dimensions. The fruit in her hat is draped with dusty cobwebs. But inside her pancake-sized open mouth, an electric kaleidoscope still runs, with green laser-like rays of light splitting and reconnecting in geometric synchronicity. Behind the light is the faint pattern of television static. From unseen speakers emanates the cries of Dorothy, from The Wizard of Oz: "Toto, come back!" Carsey says the film is typically displayed behind the kaleidoscope, but he's having issues with his VCR. He turns off the kaleidoscope and leads me down the yellow brick road to the bowling ball tree. 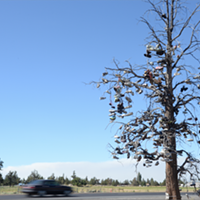 The tree is made of long steel bars, bent to resemble branches, each with a bowling ball at the end of it. 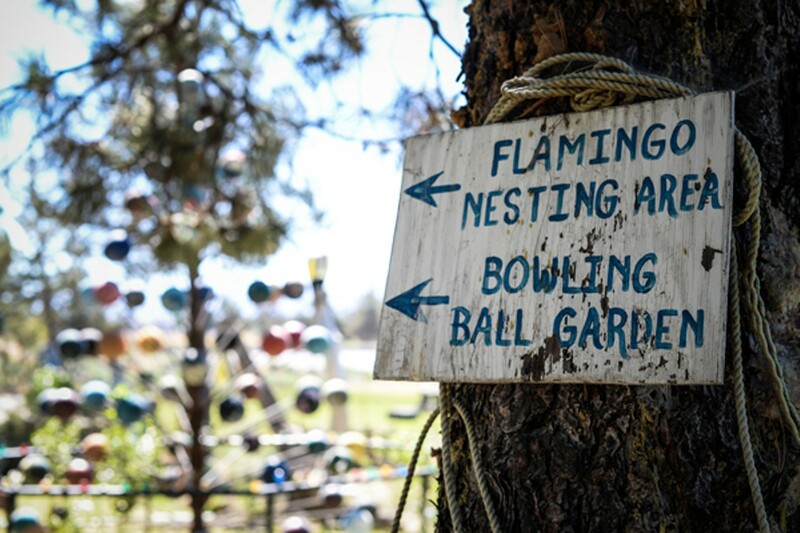 If the farm had to claim a crop, bowling balls would be the obvious choice. The shop sells bowling ball "seeds," likely harvested from the bowling ball "garden," and odd balls can be found throughout. "Do you know where bowling balls come from?," he asks, pausing to indicate that the question is not rhetorical. "Bowling alleys?" I offer, foolishly relying on logic. "Out of the closet," he answers, explaining that many of the balls have been brought by visitors who found them in the back of their closet and didn't know what else to do with them. Further down the path, another of Carsey's creations—a "telephone pole" constructed from old phones stacked on top of one another—bends in the building breeze. The spot was once a popular tourist attraction, garnering attention from the likes of the Discovery Channel, the Learning Channel, Roadside Attractions and others, but it has lost some of its luster since Craven passed away. "Since my partner died," says Carsey, "with one person taking care of it, it's getting scraggly." 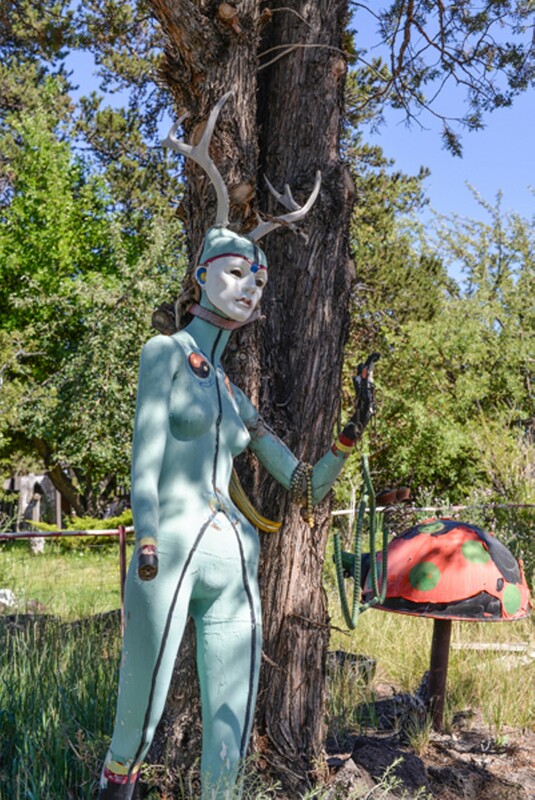 The hot sun and harsh winds have chipped the paint on many of the sculptures and weeds are growing up around the lot. Carsey pulls at a waist-high invasive species as we walk around the Love Pond—a heart-shaped irrigation pond that has been the site for about 50 weddings and commitment ceremonies over the years. Typically, the farm has held a free wedding day the last Saturday of June, where Carsey himself—an ordained minister with the Universal Life Church—presides. At the entrance to the pond stands an arrow some 20 feet tall. It's where Cupid struck and missed, Carsey explains. Another similar arrow can be found in the middle of the pond as well, right on target. Also outside, pieces of snarled wood jut out of the ground, each with a gnarly lump painted red or blue. These are "heartthrobs," Carsey says, pointing out that the colorful lumps represent both straight celebrities, such as Elvis, and gay celebrities, though he has a hard time recalling which ones. "Like Liberace," he offers, then second-guesses: "Was Liberace anyone's heartthrob? Or maybe Lily Tomlin." As we circumambulate the pond, Carsey explains that couples are supposed to sing Elvis's "Love Me Tender" as they walk. When we reach the ceremonial arch, adorned with the word "LOVE" in big, red letters, he points to either side, explaining that he once had strawberries growing on one side, and rhubarb on the other—to symbolize the joining of two complementary elements. Beyond the arch, a once-white carpet curves through the field. Now nearly bleached out by the sun of so many summers, the faint outline of pink hearts can still be seen on the carpet. The hearts aren't the only thing that's been lost with the passage of time. "The flamingos have all flown south," Carsey explains as we pass by their former nesting area. "I used to think they were an endangered species, but then I drove to the trailer park up the road." While The Wizard of Oz clearly serves as a muse, Carsey says that most of the ideas come from his own mind. He recalls a mother who once visited here with her son. The child asked why Carsey makes all these strange objects and the mother replied, "He just does the things that other people just think of doing."